While at my brother's reception my mom was showing off the bag I made for her. I walked up to say goodbye and she showed off the one I was carrying. Then my sister-in-law came by with hers. Needless to say I left the party with an order. I had to rush a little since my great aunt is leaving town (going home) this weekend. (I don't know why but I'm having a hard time focusing on sewing with the kids home. Can't wait for school to start.) Her criteria were black and white and add some red if I could. I think I did good. Here it is. What do you think? 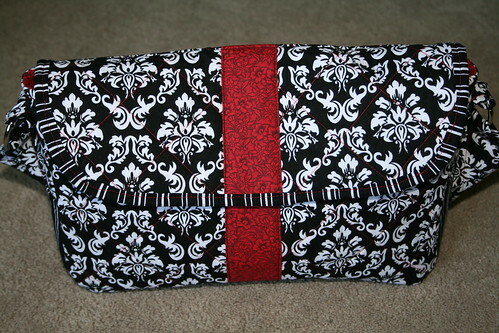 I got extra of this black and white damask to make a bag for myself. I love it! I'll be using pink for the lining though. I also found a brown damask. I have plans to make a couple different bags with that. I'll be sure to post them when I'm done. Next week I'll be working on a scripture tote for Mat and a messenger bag for Meg. They've been waiting patiently for me to get around to it. I hope I can get both done next week. I might have to ship them off somewhere to get some work done though. You know I love that purse - all the right colors, red, black and white! It's darling! Good job! 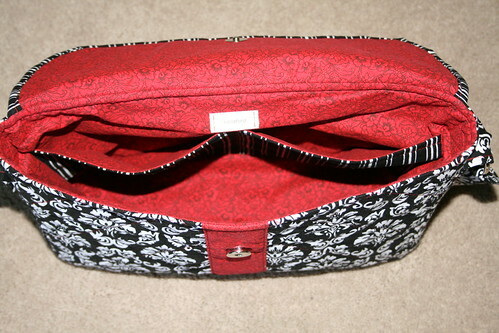 I don't even know what a damask is, but the bag is so cute! If I'm not mistaken damask is the print on the fabric. Hey . . I am Jessica Lambourne's cousin and I have always raved about the bad you made for her. ADORABLE!! I was wondering if you could make me an "overnight bag" for my daughter for her 1st birthday coming up. I think I'm also interested in the apron and coin purse that I saw pictures of. Can you email me at tlambourne@yahoo.com to give me all the details? Jessica emailed me this blog and I was trying to just find your email address to write you but to no avail . . Sorry I have to post this for the world to see.